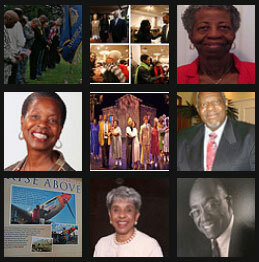 The CRC, a program of the Friends of the North Sarasota Public Library, is a reading and research center that houses books, media, and artwork on the Global Black Experience. Pictured in the photograph on the left is Mrs. Lovette Harper, Founder of the Cultural Resource Center, with Dr. Khalil Gibran Muhammad, Director of the Schomburg Center for Research in Black Culture. At Mrs. Harper’s invitation, Dr. Muhammad visited Sarasota in 2013 to keynote a fundraising event for the CRC. 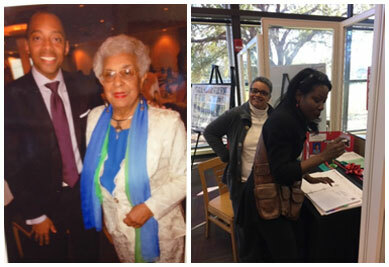 Pictured in the photograph on the right, taken in February, 2015, is Pulitzer Prize-winning author, Ms. Isabel Wilkerson signing the guestbook at the CRC. Looking on is CRC co-founder Dr. Cheryl Smith. Ms. Wilkerson had been the keynote speaker at a Manasota ASALH fundraiser for our scholarship program. Located on the State College of Florida Manatee campus, this museum is a resource for local and national Black history. It also houses many of the awards and certificates Manasota ASALH has received over the years. The historic first meeting of Manasota ASALH was held at the first site of the Family Heritage House Museum. Our annual Scholarship Awards Presentation Meeting is held at the Family Heritage House Museum. The Troupe presents both on-and off Broadway original plays and musicals that enable a diverse regional audience to experience African American history and culture. 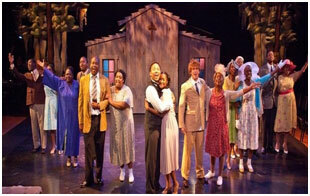 Pictured below is the cast of WBTT’s production of Ossie Davis’s African American history inspired musical, “Purlie,” which played to sold out audiences in 2013.